Police are searching for a nine-year-old girl who hasn’t been seen she was picked up in a mini cab ten months ago. Police said they are not releasing the girl’s name and fear it may have changed since she was last seen. Police decided on the appeal as a ‘last resort’, according to MyLondon. The police will also not be releasing the name into the public domain at this stage. They also said the mini cab the girl was picked up in was either yellow or white. In addition a round taxi sticker was located in the back of the mini cab. The driver of the mini cab was described as a man with a dark complexion. 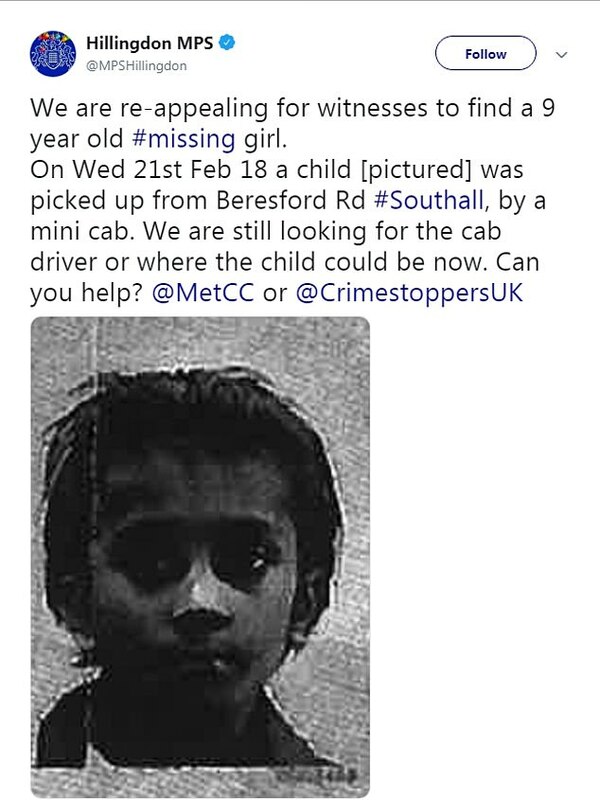 A tweet from the Hillingdon MPS account says: ‘We are re-appealing for witnesses to find a 9 year old girl. ‘On Wed 21st Feb 18 a child [pictured] was picked up from Beresford Rd, by a mini cab. ‘We are still looking for the cab driver or where the child could be now. Can you help? If anyone has any additional information they are asked to contact the Metropolitan Police or Crimestoppers.